Shashikant Jagtap takes us through the features and usage of XCFit, which can be used to enable BDD for iOS and macOS using Swift. Today, I am glad to announce “XCFit Framework” which can be used to enable BDD for iOS and macOS apps using Apple’s brand new programming language Swift and UI Testing framework. This project is inspired by Cucumberish and OCSlim project. Let’s see what are the features and usage of XCFit in this post. You can find official web page of XCFit on shashikant86.github.io. XCFit a.k.a (XCUI, Cucumberish, and Fitnesse Integrations Tests) is a full stack Xcode BDD framework for Swift iOS and macOS apps. XCFit allows us to write API, UI and Acceptance Tests with Swift in human readable language using tools like Cucumber and Fitnesse in Xcode. 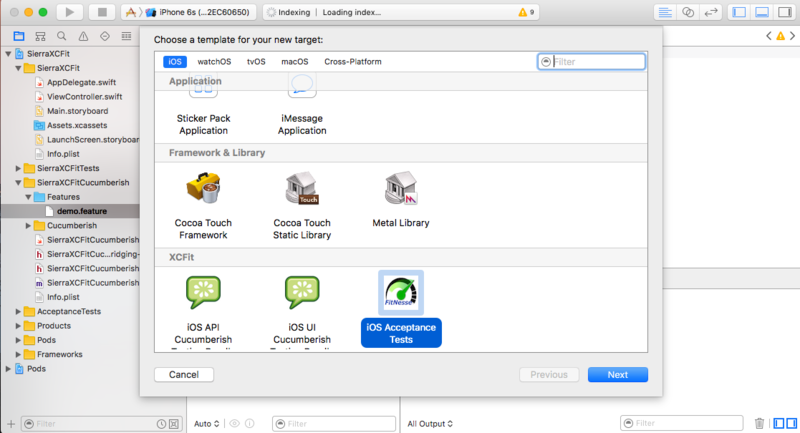 We can still use Apple’s brand new UI Testing framework (XCUI) under the hood of Cucumberish. XCFit is fully automated solution for Cucumberish and Fitnesse. You can use 80(Fitnesse):20(Cucumberish) formula to automate Acceptance and UI Testing for better coverage and faster feedback. XCFit is available on RubyGem and CocoaPods. You can now write Given When Then and Decision Table in Xcode!! YAY! Thanks to Cucumberish and OCSlimProject! And XCFit automated them!! You can now write/Execute all your Acdeptance Tests and UI Tests using Apple’s brand new programming language “Swift” in Xcode. Goodbye Appium, Calabash, Frank, KIF, and Goodbye Ruby, Java, Python. It’s pure Swift!! XCFit provides Xcode Templates to create new Cucumberish and Fitnesse targets which reduce hectic Xcode configuration steps. It’s all automated in XCFit. One command to set all fully automated Xcode template for Cucumberish and Fitnesse targets. New Template to create Gherkin Feature file in Xcode. 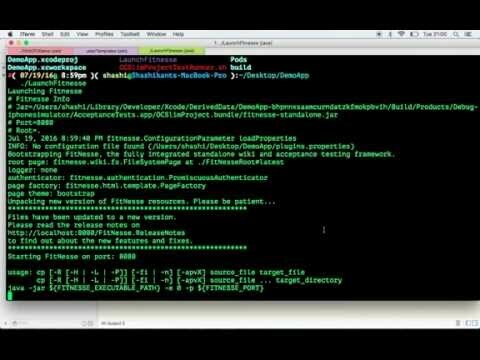 Automated Cucumberish Setup in one command. Enhanced OCSlimProject templates and automated Fitnesse download process. XCFit target templates are independent of native Xcode Test targets. We can stiil use Apple’s brand new XCUI Testing framework. Its native Xcode implementation, No Appium, Calabash, etc., etc. Setup Cucumberish and Fitnesse in Xcode within few minutes!! Run Unit, UI and Cucumberish test with Xcode. “cmd + U”. Edit Scheme, if nessesary, to avoid running Unit Tests for this demo. Or Run nit from command line. Update Simulator device/OS version as installed in your Xcode, if nessessary. Watch out HTML and JUnit reports generated in the ‘Build/reports/’ directory with XCPretty. Install XCpretty if you haven't got it already. Running Fitnesse Tests: Clean, Build, and Execute. $ xcodebuild -workspace XCFitDemo.xcworkspace -scheme XCFitAcceptanceTests -sdk iphonesimulator -destination 'platform=iOS Simulator,name=iPhone 6,OS=9.3'clean build | xcpretty $java -jar fitnesse-standalone.jar -v-o -c "FrontPage?suite&amp;format=junit"
Currently, XCFitDemo App is configured on TravisCI which runs both Cucumberish and Fitnesse Tests. The sample .travis.yml is in the Github repo and sample logs from TravisCI here. XCFit automated configuration of these two guys. Curl on Mac – Might be pre-installed but worth double checking. XCFit requires RubyGems to run. Now you are good to get started with XCFit for now. Later we also need to install XCFit Pod. Once Clicked on the target e.g ‘Cucumberish UI Test Bundle’ Xcode will create UI testing target with all the required files with Bridging hrader for Cucumberish UI Testing. Once Clicked on the target e.g ‘Fitnesse Acceptance Test Bundle’ Xcode will create UI tAcceptance test with all the required files with Bridging headers for the Fitnesse Acceptance Test. We will see that in details soon. You can watch YouTube video of XCFit setup here. This script also set new file type in Xcode to create new Gherking feature file. 3 Steps to setup Cucumberish. You don’t need to use Cocoapods to setup this target. Now that Xcode has created a brand new target with all required Swift and Objective-C files to run Cucumberish. All Xcode setting has been done by the Xcode Template. Don’t worry about configuring anything. This will download Cucumberish directory from version 0.0.7 and also creats ‘Features’ directory. You can then reference those directories in Xcode. For the “Cucumberish” directory, select ‘Copy if needed and Create Group’ and for the “Features” directory select don’t create group or Copy if needed. Just ” create folder reference” Now Add sample Feature File to ‘Features’ directory either by File->New->Gherkin Or Just add it using your favourite text editor e.g demo.feature with content. You can watch YouTube video of Cucumberish Setup here. You can add more feature/Scenarios and implement steps definitions inside your Swift File. Ahmed-Ali creator of Cucumberish already implemented useful pre-defined steps have a look at this Swift file. You are free to try Page Object Pattern and all other crazy stuff to abstract and refactor your Swift code. You can also setup Fitnesse Acceptance Tests but you need to use Cocoapod for this target. Run ‘Pod install’ and build newly created Acceptance target from Xcode. You should see ‘LaunchFitnesse’ Script generated and Your app should be talking to fitnesse now. Now you should have Fitnesse up and running. Follow Paul’s article for the details on how to write acceptance tests here. You can watch YouTube video of XCFit Fitnesse here. Continous Integration is very important and you simply can’t avoid that. XCFit will be easily configured on any CI server including Apple’s own Xcode Server or very popular one Jenkins as we can generate reports in both HTML and JUnit format. As of now, you might be running tests within Xcode, but there are some awsome tools which allow us to run our tests from command line. The ‘xcodebuild’ is being used to build and test Xcode Schemes. Fastlane seems much easier option to automate everything but it’s up to you. 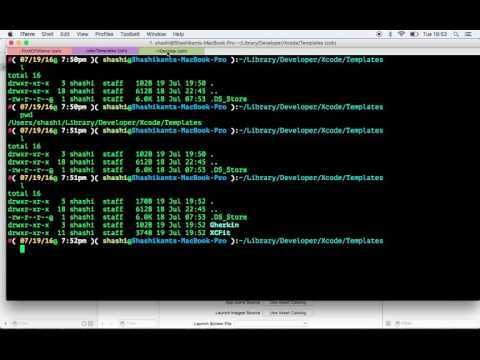 These are long commands but you k ow better how to Script it Or Fastlane it, right ? You can execute Cucumberish tests with like this for XCFitDemo App. You can now analyse the reports generated in the ‘build/reports’ directory. You will find both HTML and JUnit reports. You can configure these reports with Xcode-Server, Jenkins, TeamCity easily in the post build setting. You can first build the Acceptance target. $ java -jar fitnesse-standalone.jar -v-o -c "FrontPage?suite"
You can also set reports directory and generate Junit style reports inside the “XCFitDemo/FitNesseRoot/files/testResults/” directory. You can configure these reports with Xcode-Server, Jenkins, TeamCity easily in the post build setting. What XCFit Can Solve in iOS/macOS Team? Better Developer/QA collabration, Early QA Involvement. Usually,in the iOS development world, Developer build an app using Swift and Objective-C and army of manual and automated QA uses tools like Apppium, Calabash using languages like Ruby, Java, Python WTF!!. QA and Developers world is totally different. With XCFit you will be speaking the same language that is “Swift”. QA can write test script as we build. No need to wait until build is handed over. Just work with developers! Little bit of learning curve for QA but you will save developers time as they don’t to learn Java, Python, or Ruby to help the QA team. 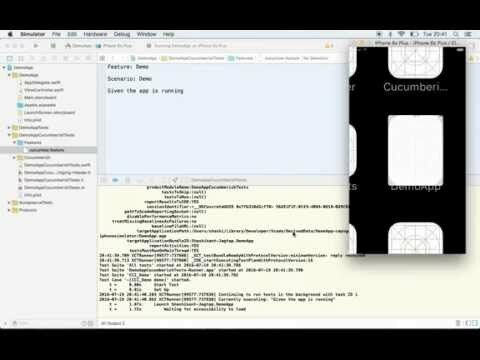 You will be surprised by how easily/quickly you can setup Fitnesse(Acceptance Test) and Cucumberish(UI Testing) environment in Xcode and running your first test. As we can now able to write scenarios with Given/When/Then and decision tables. We can get business people involved to contribute to acceptance criteria. In short we got all benefits of BDD in iOS/macOS project. You must be happy as you won’t need to learn other languages just in case QA ask something to solve. With XCFit it’s everything Swift. As of now your QA team might have tried all wrappers on UIAutomation, e.g. Appium, Calabash, Frank, KIF, etc., etc and keeping themselves busy writing some Ruby, Python, and Java code to automate testing and all that attempts results in Slow, Brittle, Untrusted, Non-valuable UI tests causing harm to mobile development rather than good. With XCFit, everyone will be speaking the same language and you can cover business logic with lighting fast Fitnesse Tests and major journeys with UI tests. Keep it 80:20 means 80% Fitness and 20% Cucumberish or XCUI. Full Stack BDD for iOS and macOS Apps with Swift, Xcode using XCUITest, Cucumberish, FitNesse and friends. Let me know what you think about XCFit. Create an issue on GitHub if you want more info.